Disneyland Paris guests are set to be transported to the world of superheroes with the opening of its new Marvel Universe-themed hotel. 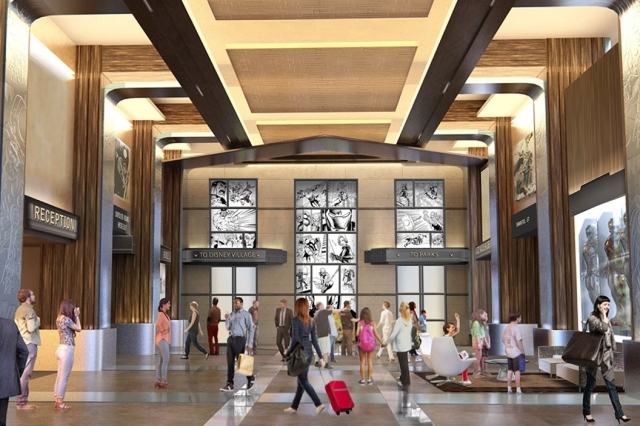 Hotel New York – The Art of Marvel will replace the resort's current Hotel New York. An opening date has not been released but details of the hotel were revealed as part of Disney Parks and Resorts Chairman Bob Chapek' presentation to tens of thousands of fans at the D23 Expo in Anaheim earlier this month. Chapek announced the "reimagination" of the Disney's Hotel New York into a new Marvel-themed wonderland. "We're going to create a hotel at Disneyland Paris that would make Tony Stark proud," he said. "I'm thrilled to announce that Disney's Hotel New York – The Art of Marvel will transport our guests to the action-packed, inspiring world of Super Heroes including Iron Man, The Avengers, and Spider Man among others!" 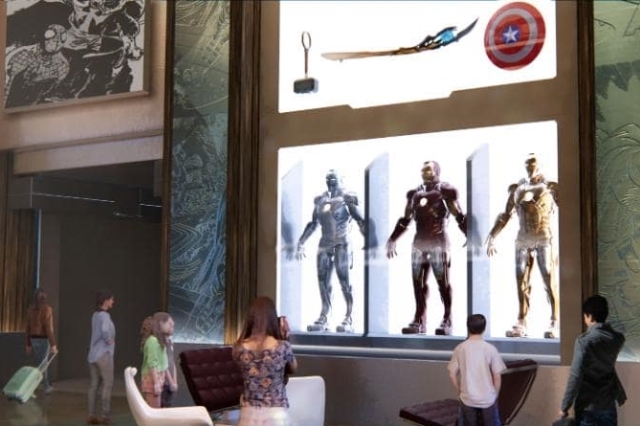 The four-star hotel will resemble Iron Man's skyscraper home, Stark Towers, and feature costumes, props and drawings from the Marvel films displayed throughout the public spaces. It is expected to offer 565 guest rooms. In 2011, Hotel Plaza Athenee added luxurious toy-themed suites to its rooms. The two Barbie-themed rooms were decked out in Barbie's favourite colours - pink and white - and were complete with pet grooming tables, royal linens and Barbie dolls. There was also a Hot Wheels room with a custom car bed, tracksets, games and gadgets for tiny car lovers. The world has gone panda mad, so much so that China will open the first panda hotel in May, with everything inside a tribute to the endangered animal. Guests at the Haoduo Panda Hotel in the Sichuan province will sleep in one of 32 bedrooms kitted out with cuddly toys, panda wallpaper and bedside tables shaped like the animals. The staff greet guests dressed like the cuddly creatures too. If that wasn't enough, each room comes with an additional theme: tea culture, paper-cutting, car and more! Motor fans will be revved up by the V8 Hotel which lets them sleep in classic cars. Rooms are based around motoring themes so you can pretend you're at an American drive-in and sleep in a Cadillac or slumber in a Mercedes car wash. There is also a room designed like a Morris Minor garage and you can snooze in a Herbie-style Volkswagen. The four-star hotel in Meilenwerk automotive museum boasts shops, a restaurant and even an event hall based around cars! Love The Beatles? Hard Days Night Hotel in Liverpool is the world's only Beatles-inspired hotel, located at the heart of 'Beatles Quarter' and offering luxury accommodation with a twist. Check in to the McCartney Suite, with books and artwork dedicated to Sir Paul, or the Lennon Suite with its white piano and John Lennon artwork. The hotel's restaurant Blake’s is named after the Sergeant Pepper album cover and serves up classic British and home-cooked dishes. The hotel sits adjacent to the Cavern Club where the Beatles rose to fame, making it the perfect getaway for music lovers. Sin City is also home to New York City in the form of the New York-New York Hotel & Casino. This Big Apple-themed resort boasts architecture that evokes the New York City skyline and has several famous towers including, the Empire State Building and the Chrysler Building. In front is a lake representing New York Harbour with a 150 ft-tall replica of the Statue of Liberty and you'll even find Main Immigration Building on Ellis Island and Grand Central Terminal. Inside, the restaurants, bars, entertainment venues and lounges are named after famous New York landmarks and neighbourhoods, such as the main casino area named Central Park and shops in SoHo Village. Brussels' Pantone Hotel is chic, cool and above all, colourful. The hotel for colour-obsessed guests features Pantone-branded mugs, chairs, artwork - but in a tasteful way. Each of the seven floors is dedicated to a different colour palette and the rooms have white walls with blankets and artwork providing bright pops of colour. There's a bar on the rooftop terrace with bright cushions that is perfect for summer evenings in the city. Lovers of superheroes and comic books will want to book a stay at the Comics Guesthouse in Rome, which is a unique hotel close to Lepanto Metro Station. Each room is themed around a comic book character and there is a Wii, PlayStation and arcade games in the lounge. Rooms are bright and colourful with favourite cartoons such as Super Mario Brothers and Betty Boop. Each comes with an LCD TV and private bathroom. This quirky hotel in Alberta offers more than just one theme. At Fantasyland you can choose to snooze in rooms called Hollywood, Roman, Polynesia, Truck and Victorian Coach to name but a few. Personally, we'd go for the Roman-themed room - we've always wanted to sit in a Jacuzzi that has water poured by a Roman statue! Many of the rooms have bunk beds so children can join in the fun too and don't miss the Galaxyland Amusement Park with its array of indoor rides. Istanbul’s Jazz Hotel is located in the trendy Nisantasi district and pays homage to the legacy of jazz with a concept and decor inspired by jazz music. The 12 rooms in the boutique hotel are named after world-famous jazz artists, like Ella Fitzgerald and Louis Armstrong. Each room is decorated with prints and posters of an artist, as well as an original LP on the door and the artist's music playing in the room. You can borrow jazz books, CDs and DVDs from the hotel’s library and even the hotel staff’s ties, pins and aprons are based on the jazz theme. How do you embrace Paris when you're already in Paris? Stay at the Paris-themed Hotel Secret de Paris! As if visiting the City of Lights wasn't enough to give you a taste of the French capital, this design hotel allows you to prolong the magic, even after bedtime. Each room has been designed to conjure up some of the city's finest monuments. Fancy floating on the first floor of the Eiffel Tower? Snoozing under the great clock of the Musée d'Orsay? Or sleeping in a raunchy red room reminiscent of Moulin Rouge? Take your pick and enjoy the ultimate Parisian getaway. We'd be less impressed by this hideaway if it was set in coastal Spain or on a Greek island but the quirky abode can be found in the village of Dymchurch in Kent, offering guaranteed sun all year round! Beach Sun Retreat is a private beachfront house, just an hour from London, and features a Real Sunlight multi-sensory room, with a St Tropez-style living area that provides a tropical haven for you to top up your tan and beat health conditions, such as SAD, stress and Vitamin D deficiency. There is also a cinema room, full DJ equipment and al-fresco-themed living spaces. Who needs to jet away when you can find tropical island bliss in Kent?